Sharing your private Distribution Lists allows you to permit groups and users to see its content and use it in schedules while you retain ownership. Authorized users can share their private Distribution Lists with groups and users with whom they are permitted to share. The Distribution List can be accessed by users authorized to access the folder in which the shared Distribution Lists are located. Authorized users can publish and unpublish Distribution Lists to make them available to users authorized to access the folder in which they are located. Publishing requires the folder the item is located in to be published in order to publish an item within the folder. If the folder is subsequently unpublished, all items in that folder are unpublished. See the WebFOCUS Security and Administration manual for additional information on Publishing folders and items. From the tree, if you are authorized to share your private content, you can share a Distribution List with users authorized to access the folder in which the Distribution List is located by right-clicking the folder or Distribution List in the tree and selecting Share. If you are authorized for advanced sharing, you can share your private content with specific groups and users with whom you are authorized to share by performing the following steps. In the tree, select the Distribution List you want to share. Right-click the Distribution List and select Share with. The Set Sharing dialog box displays, as shown in the following image. Use the left and right arrow buttons to select which Groups will have access to the Distribution List. Use the left and right arrow buttons to select which Users will have access to the Distribution List. The following steps allow you to publish a Distribution List or folder. Note: A folder must be published in order to publish items within it. Published items or folders display in color. Those that are unpublished display in black and white. From the tree or ReportCaster Explorer, select the Distribution List or folder that you want to publish. Right-click the folder or Distribution List and select Publish. From the tree or ReportCaster Explorer, you can unpublish a Distribution List or folder. From the tree or ReportCaster Explorer, select the Distribution List or folder that you want to unpublish. Right-click the published folder or item that you want to unpublish and select Unpublish. From the tree, authorized users can set security for published Distribution Lists, allowing other groups or individual users to access and manage the lists by performing the following steps. Note: Authorized users can review the Security Policy by right-clicking the resource in the tree and selecting Security, then Effective Policy. For more information, see the WebFOCUS Security and Administration manual. In the tree, select the published folder containing the Distribution List or the published Distribution List for which you want to set security. Right-click and select Security and then click Rules. The Security Rules dialog box displays, as shown in the following image. Click the Group or individual users to whom you would like to grant access to the Distribution List. The Roles appear in the Rules for Group section. Select the Role that defines the functional capabilities for which to set the access level. Choose the access level in the Access drop-down list. Not Set. Access is not specifically set. Access is determined by inherited rules. Permitted. 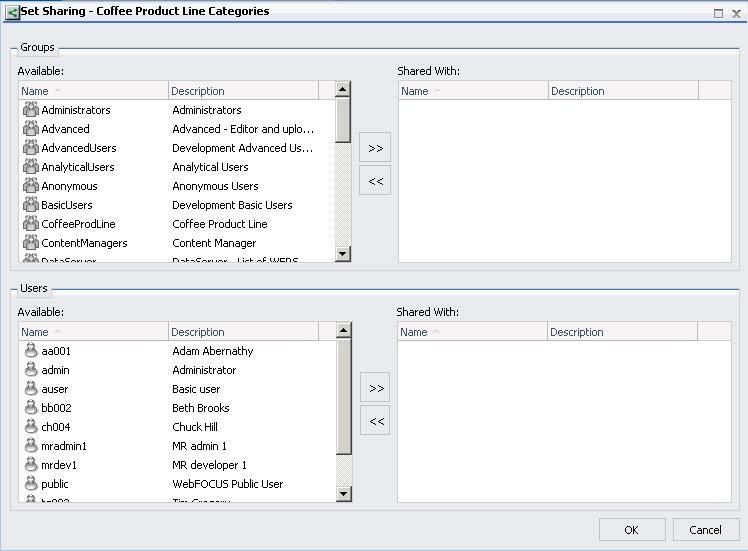 Allows the functionality of the selected role as specified in the Apply To drop-down list. You can select FOLDER_AND_CHILDREN, FOLDER_ONLY, or CHILDREN_ONLY in the Apply To drop-down list. Denied. Denies the functionality of the selected role at the level specified in the Apply To drop-down list. You can select FOLDER_AND_CHILDREN, FOLDER_ONLY, or CHILDREN_ONLY in the Apply To drop-down list. Over Permitted. Overrides a Denied access level to allow the functionality of the selected Role at the level as specified in the Apply To drop-down list. You can select FOLDER_AND_CHILDREN, FOLDER_ONLY, or CHILDREN_ONLY in the Apply To drop-down list. Clear Inheritance. Erases all previously defined rules for the selected Role at the level specified in the Apply To drop-down list. You can select FOLDER_AND_CHILDREN, FOLDER_ONLY, or CHILDREN_ONLY in the Apply To drop-down list.